I’ve come to the point where I have to concede the fact that my aversion to the horror genre is becoming a tad outlandish especially considering I purport to be a lover of film. The thing is, I just haven’t been able to stand the frightening thrills and terrifying panic that comes with horror films. I have not seen a single one since my days in boarding school (2009) where any contact with film was rare and ostensibly welcome. The worst thing about horror films growing up was the nightmares that followed for days on end. When I was a kid anything I saw that felt remotely terrifying followed me to bed. To be fair, it didn’t take an actual horror film to give me sleepless nights, just anything unsettling like the first Terminator although in truth I saw that when I was 5, most kids would have been terrified. I also remember being frightened as hell by Jurassic Park and The Predator especially, to name a few, where some mainstream films that scared the hell out of me so I was never going take warmly to actual horror. Like I touched on earlier, my first sustained encounter with the genre was in boarding school were I had no say in the movies screened to us and it turns out most of the boys were fans of horror. I still know a good film when I see one and the presence of scares will not put my assessment of a film off so I could tell most of the horror films we watched were basically shite. It was just the standard quiet, quiet BANG!!! Then some more quiet, quiet with a louder and gory bang but there were a few good ones in there; I saw Halloween in school, an all-time horror classic and the Saw films or the first 3 were good but the masses generally preferred the cheap thrills and scares of films like Jeepers Creepers and the pointless Texas Chainsaw Massacre remake. The nightmares reared their heads for a minute in school and after I was done with St Peters, I decided I was also pretty much done with done with horror, I haven’t properly seen one since probably Wrong Turn 2. Some 5 years later and some significant personal development later were I feel I am cine literate, I realise I am missing out on some of the best the history of cinema has to offer by way of films and directors. Horror films are generally meant to be unsettling films that induce a sense of fright and dread. They deal with our most primal nature and its fears: our nightmares, our vulnerability, our alienation, our revulsions, our fear of the unknown, our fear of death and dismemberment, loss of identity, or fear of even sexuality. Whatever dark, primitive, and revolting traits that simultaneously attract and repel us are featured in the horror genre. The first horror films I saw were often combined with science fiction when the menace is related to a corruption of technology, or when Earth is threatened by blood thirsty extra-terrestrials. However the first horror films were kind of synonymous with the supernatural and the fear of the unknown. The first horror movie, about 2 minutes long, was made by a French filmmaker Georges Melies, titled Le Manoir Du Diable in 1896 (The Devil’s Castle) . This contained elements of later horror and vampire films: a flying bat, a medieval castle, a cauldron, demons, creepy skeletal figures, ghosts, witches – and a crucifix to dispatch with evil which introduces a religious element which was to become a mainstay of horror films. Probably out of necessity, the early horror films were Gothic in style. They were usually set in spooky old mansions and shadowy locales. The original icons of horror were the vampires, demented madmen, ghosts, monsters, mad scientists akin to the Frankenstein story, demons, zombies, werewolves etc. Horror films developed out of a number of sources; folktales with devilish characters, witchcraft, myths, ghost stories, Grand Guignol melodramas, and Gothic stories by way of Victor Hugo or Irish writer Bram Stoker from Europe and American writer Edgar Allan Poe. Bats are seen as symbols of fear maybe because they have frightened sissies like me all over. Vampires began to emerge in popular fiction of the 18th century, during which time Bram Stoker’s 1897 vampire novel Dracula was written. 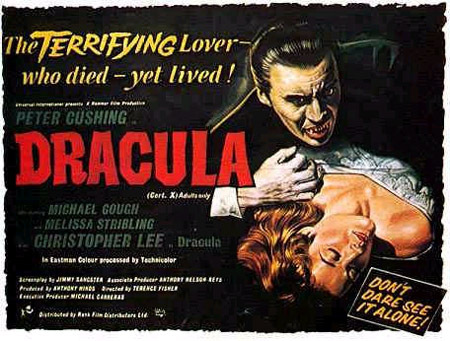 It has become the most popular, influential and foremost source material for many vampire films. Stoker’s ground-breaking book birthed the elements of future vampire films. Things seem to have changed with vampires now sparkling in daylight and never turning into bats but Stoker’s vision of intrigue and horror will always be the true benchmark for vampires. The universal monsters are being rebooted with Frankenstein, the Mummy and Dracula, which has already hit the screens via Dracula Untold and it is a decent movie for people who are ignorant of the true roots of the vampire. Other icons of horror have emerged over the years with the onset of the slasher movie genre with Jason, Freddy, Chucky, Ghost face etc. becoming mainstays of the history of horror cinema. Demonic possessions have also stood the test of time with its overt juxtaposition with religion and I’m pretty sure the first film on my list when I do start watching Horror will be the Exorcist. I’m hoping the Exorcist will offer me some sensitisation of sorts as I start this dread induced journey. The Excorcist is widely hailed as the most terrifying film of all time with no room for amusement for even the most hardened of horror fans. Ultimately, I will be interested in how auteurs like Cronemberg and Del Toro us the horror genre as a medium for exploring themes of varying significance but I guess I’ll have some more on that when I actually start watching some horror films. It’s mainly because of the 2 said directors that I’m looking to repent from this cinematic heresy. The horror genre has done too much for cinema and art to have been disregarded by myself for so long. I imagine people who are engrossed in horror films are looking to an opening into that scary world, into an outlet for the essence of fear itself but without actual danger. For me, a horror films follows me wherever I go. I start to see figures in the shadows, hear noises where there aren’t and of course the nightmares follow and I’m pretty sure I’m not alone – they just have that effect. The thrill and the fun factor that people seek and indeed derive from these films have never really rubbed off on me. The ideal horror film I imagine will be the ones that know their essence is NOT in the fear inducing special effects but something more. The best horror films only hint at the horror and allow our minds to run wild. I feel the goal should be create some internal state of fear and chaos in the audience and not merely to show them horrifying and distressing images. Anticipation of an impending horror will be more important than the horror itself and the execution is more important if not as important as the end. The quiet, quiet, bang formula may be mainstream but it ultimately lacks any form of soul. Al terror should have some form of melancholia and the film maker as always must be looking to engage us by getting us to connect with and share the fears of the characters on screen. It’s interesting the affinity the horror genre has to indie and low budget flicks which lean toward the genre purists who approach films with minimal compromise. When I do start watching horror films proper, it will be interesting to note the trends and what not. New films always borrow from old films in a perpetual mix of subgenres and new techniques or even pastiches to make something for the contemporary culture. The purist feel the horror genre is dying and some extremists feel it died a while back but what is left is for God to grant me some grace and balls as I prep to sit through the Exorcist somewhere in January next year as I start my walk with horror.